Due to the wide array of different bur sizes and shapes, standard numbering systems are used to make it easier to identify and compare burs. The most common are the U.S. numbering system and the ISO (International Standards Organization) numbering system. The U.S. Numbering System – Most commonly used in the U.S for carbide burs; generally a one to four digit number, depending on the type of bur. E.g., 557FG, 557RA. 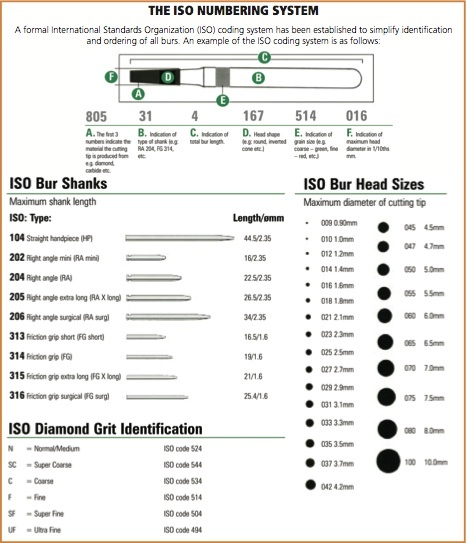 The ISO Numbering System – Most commonly used for diamond burs in the U.S. (Also for carbides, but not in the U.S.) See our cross- references to match ISO and other numbering systems on pages 20-21.